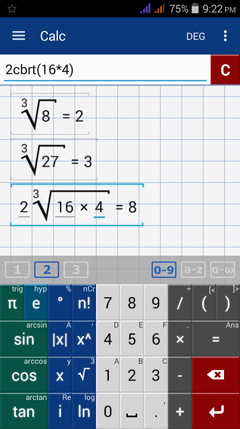 Tap the square root key once (highlighted below) to enter a square root. Type in the radicand (argument) in parentheses. 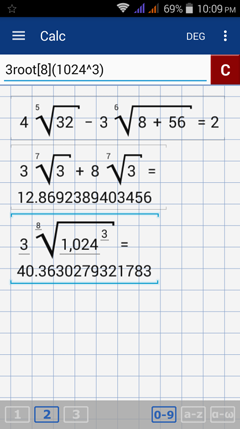 The square root function displays sqrt ( ) by default. Tap the input field to edit the argument. Tap the square root key twice to enter a cube root. Type the radicand in parentheses. The cube root key displays cbrt( ) by default. Tap the input field to edit the argument. root4( ) by default. Tap the input field to edit the argument. The simplest way to find a root is to type "root" using the a-z keyboard, enter the index (the root) in brackets, and enter the argument in parentheses, as shown below. Simplify each radical using the root command. Type "root" before each argument and enter the index in brackets. 1) Tap the root key three times to display root  ( ). In the input field, change "4" to your desired index. Type the radicand in the parentheses. 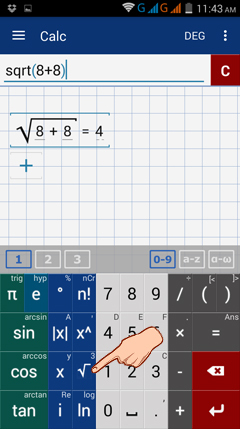 For example, to calculate the 5th root of 32, tap the root key three times, delete the 4, and change it to a 5. Type "32" in the parentheses. 2) Use the root command. Switch the the a-z keyboard and type in "root." Enter the index in brackets immediately following "root" and the radicand in parentheses without spaces between the symbols. For example, to find the 5th root of 32, type in "root(32)." Tap the square root key three times and change the index. 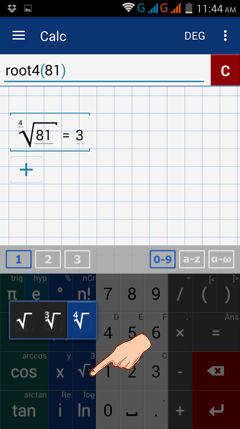 1) Type 4root(32), change the "4" to a "5" such that the expression becomes: 4root(32). Continue using the same method to change the given index "4." Type "root" using the a-z keyboard. Type each expression as it appears in the problem. 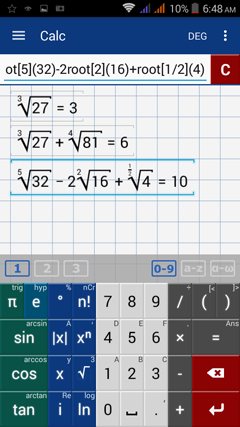 Use the square root key or type "root" along with the given index in brackets. Write each radical as an exponent. Type each expression as it appears in the problem. Make sure to enclose each exponent in parentheses.